Flax seeds can help improve digestion, promote weight loss, improve skin health, boost focus, enhance cognitive function, reduce risk of heart disease, cancer, stroke, and diabetes. Flaxseeds, sometimes called linseeds, are relatively small (the size of a sesame seed) and can be reddish brown or golden yellow in color. Despite their small size, flaxseeds pack quite a nutritional punch. Flaxseeds are specifically known for their rich omega-3, omega-6, and omega-9 rich nutrient profile. These good fats been shown to improve cardiovascular, heart health, brain function, focus, motivation, energy, vitality, and strength. Each tablespoon of ground flax contains 2 grams of omega-3s, the equivalent of taking 2, 1000mg fish oil capsules. These fats have numerous health benefits and are often under-consumed by Americans. In a study showed that 70% of Americans are deficient in omega-3-fatty acids according to the Dietary Guidelines Advisory Committee report. 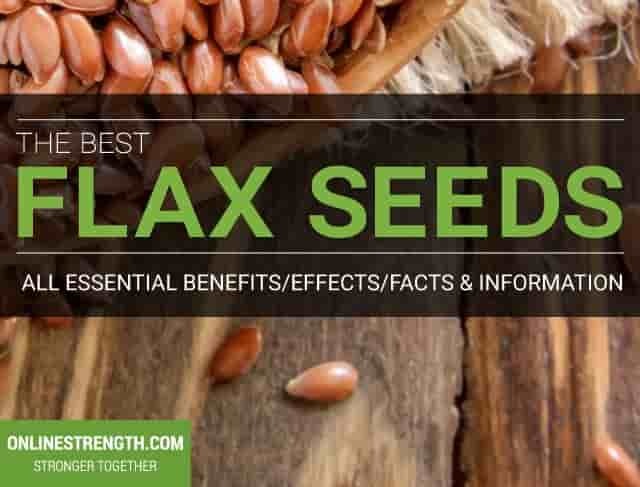 Flaxseeds rank as a #1 source of lignans. Lignanshelp protect against certain kinds of cancer, especially cancers of the breast and colon, by blocking tumor formation. Flaxseeds are best consumed ground as our bodies cannot access the nutrients if they are eaten whole and they will pass through undigested. Its important to first grind up the seeds because whole seeds will pass through your system undigested. Whatever your desired method, shake, smoothie, oatmeal, baked goods..the person who consumes flax seeds on a regular basis will significantly improve their overall quality of health and well being.